I’ve written a few times on the question of one of my favorite hangouts on the planet, underwater tropical coral reefs. Don’t know if you’ve ever been down to one, but they are a fairyland of delights, full of hosts of strange and mysterious creatures. I’ve seen them far from the usual haunts of humanoids, where they are generally full of vigor and bursting with life. I’ve also seen them in various stages of ill-health, including the bleaching caused by occasional high temperatures (which a healthy reef recovers from in a few years). In all of my writings on this subject, I’ve said that the health of the reef depends in large part on parrotfish. I’ve proposed that atoll nations declare the parrotfish as their national bird, just to bring attention to the fish that are responsible for the very existence of the atolls themselves. This is for two reasons. First, parrotfish are herbivores. They graze on the algae that is constantly trying to take over the reef. This keeps the reef clear of algae so that the coral polyps can get the sunlight that they need to survive. Second, the parrotfish graze by biting off chunks of coral. They crunch these up between specialized bony plates in their throats, digest all of the greenery, and they subsequently excrete nothing but the finest, whitest, softest coral sand … the very sand that makes the romantic tropical beaches. It’s quite funny to see what happens if you disturb a whole school of them—they drop their entire load and disappear in a flash, leaving nothing but a white cloud of sand slowly dropping to the ocean floor, eventually to be swept by the waves up onto the beach. Unfortunately, although parrotfish are wary during the day, they sleep at night out in the open. As a result, the advent of the waterproof flashlight has led to their local extinction on many reefs. To bring this story up to the present, over at his excellent NoTricksZone website, Pierre Gosselin points out a press release from the International Union of Concerned Scientists (IUCN) entitled From despair to repair: Dramatic decline of Caribbean corals can be reversed. 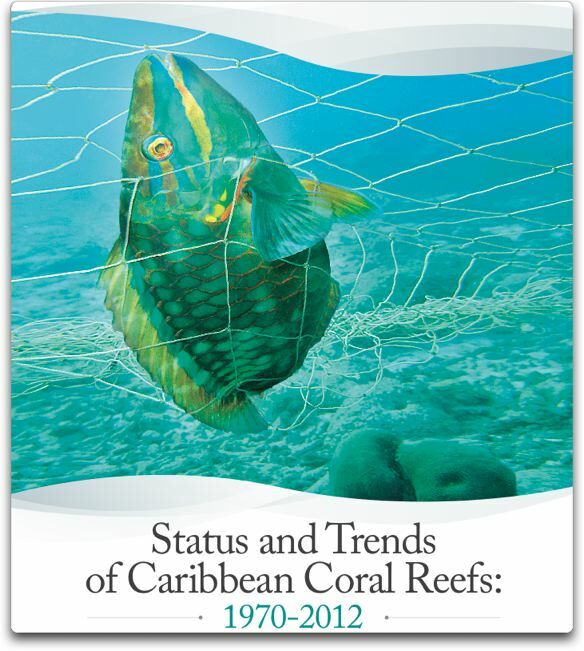 It discusses a recent report called “Status and Trends of Caribbean Coral Reefs, 1970-2012″, linked to below. Climate change has long been thought to be the main culprit in coral degradation. While it does pose a serious threat by making oceans more acidic and causing coral bleaching, the report shows that the loss of parrotfish and sea urchin – the area’s two main grazers – has, in fact, been the key driver of coral decline in the region. Despite the obligatory nod to climate change, they have finally come to their senses. Now, the IUCN has been heavily invested in the “climate change” meme, so I find this to be a most welcome sign that perhaps some sanity is returning to the field. Back a decade ago I wrote about role of parrotfish in reef loss, but at that time everyone from the Sierra Club to the IUCN were blaming climate change. And this is one of the huge problems with blaming everything and its cousin on climate change—when you blame wrongly climate change, you ignore the real problem. For example, the claimed (but illusory) “sinking” of coral atolls was long blamed on sea level rise from climate change. Outbreaks of Acropora and Diadema diseases in the 1970s and early 1980s, overpopulation in the form of too many tourists, and overfishing are the three best predictors of the decline in Caribbean coral cover over the past 30 or more years based on the data available. Coastal pollution is undoubtedly increasingly significant but there are still too little data to tell. Increasingly warming seas pose an ominous threat but so far extreme heating events have had only localized effects and could not have been responsible for the greatest losses of Caribbean corals that had occurred throughout most of the wider Caribbean region by the early to mid 1990s. So … will the reefs abide? Fortunately, we now know that waving our hands at CO2 is not the solution to the problems of the reefs—as with far too much of such CO2 hysteria, the underlying problems indeed have human causes, but they have nothing to do with CO2. And that’s great news, because although we have no hope of changing atmospheric CO2, we can indeed do something about overfishing of parrotfish, and about coastal pollution. Fix those, and we’ll fix the reefs, and they will abide. Best regards to everyone, and thanks for all the parrotfish, I’m off for Las Vegas.